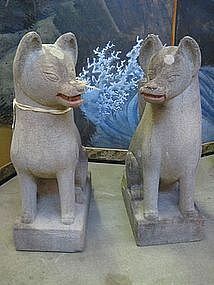 Pair of Fushimi Kitsune Stone Foxes, Shinto shrine guardians have a lively and attractive appearance, red pigment to mouths. Inscription on back shows the address of the Inari Fushimi Shrine and the name of the carver. From right to left (with the characters of a word running down): Joshu--(the area of Kyoto was called Joshu in old days), Fushimi, Kyomachi -(Kyoto town), Ishiku (stone maker), Izumisei (the name of the stone maker). Size: 24.5H 19W 11W, Edo Period, 18th/19th century, cracks.